Every dredge card is in a sense a combo card, but Life from the Loam is even more so. You may recall that its first use was with lands with cycling to basically draw an infinite number of cards over a couple of turns – and that’s basically the most innocent use of it. It’s an almost unstoppable win when combined with Seismic Assault, and it’s probably a good thing that there’s only one format where it’s legal along with Wasteland. I don’t play in tournaments nowadays, but I assume that this is one of the reasons for all the bizarrely powerful anti-graveyard cards in recent sets: at least you can Path to Exile a Golgari Grave-Troll. For the most part, the Ravnica: City of Guilds cards with dredge see play purely for that lovely dredge number. 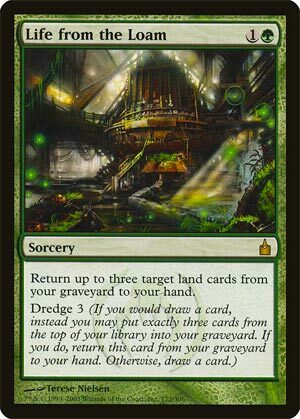 Life from the Loam is a bit of an anomaly; it actually sees play for its effect (though the dredge is a very nice bonus). Life from the Loam is a fairly cheap spell with a potent effect: get three lands back. Fetchlands, lands that sacrifice themselves for effects, land destruction targets…all lands are fair game with Life from the Loam. Dredge 3 makes this card even better, since you can dredge to try and find lands to bring back with it…and while dredge 3 is maybe a bit low to see consistent play otherwise, it’s more than enough in conjunction with a usable effect like this! Life from the Loam sees semi-consistent Modern play in decks like Valakut combo as a fall-back in case things go south…and in dredge-based decks as the rare spell with a good effect on top of the dredge. Not to say other dredge spells are useless as spells, but this comes the closest to performing well without the dredge upside.